Easter is around the corner, but I don’t fancy chocolate bunnies and plastic eggs much. However, I do love me some hard boiled eggs dyed in soft pastel colors. Eggs are the perfect protein – and the perfect inspiration for my next outfit. Before this blue shade became synonymous with the famous jewelry retailer, Tiffany’s, and dubbed “Tiffany blue,” it was simply known as robin’s egg blue. This light medium toned blue is perfect for someone who wants to channel the Easter color palette without dabbling in traditional pastels. No church service or egg hunt for me – I’d much rather be at brunch sipping on bottomless Bloody Marys come Easter Sunday. To give some edge to an otherwise prim and proper look, I opted to wear just a bra under this lacy blouse. The matching blue makes it subtly alluring without drawing undue attention as “racy lacy.” For the bottom, I needed something just as girly and feminine to rival the lacy business of the blouse. 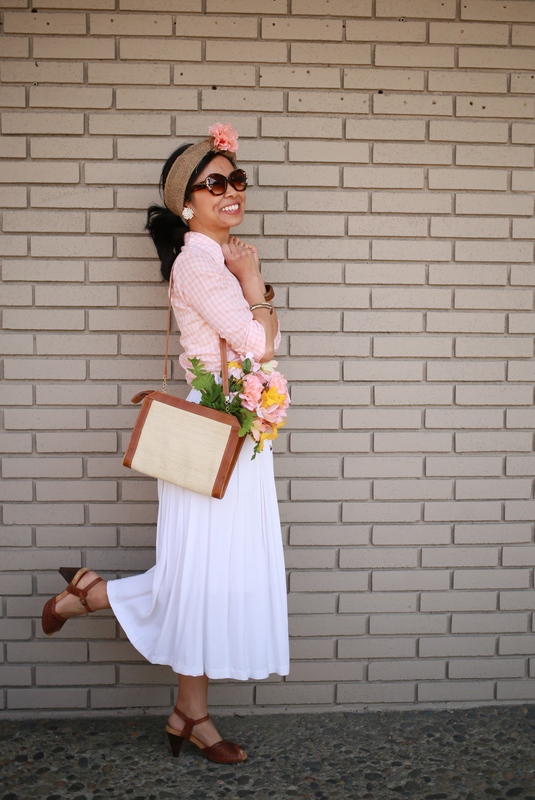 This ballerina midi lent from my friends at Lalakitty was just what I was looking for: it’s ladylike, ethereal, and the midi length makes it so appropriate for church and Sunday brunch afterwards. The airy layer of tulle material makes me feel like a modern day ballerina without needing to go on my tippy toes. I accented the outfit with pops of red. Sunday best wouldn’t be best without a hat – you may recognize this red basket pillbox from last Easter. A red leather belt cinches the waist and seamlessly fuses the blouse and skirt into one cohesive ensemble. The resulting look is one that appears to be a dress rather than separates. Red shoes are a definite must to complete this look, and these vintage peep toe pumps pay homage to my candy peeps without the added calories. 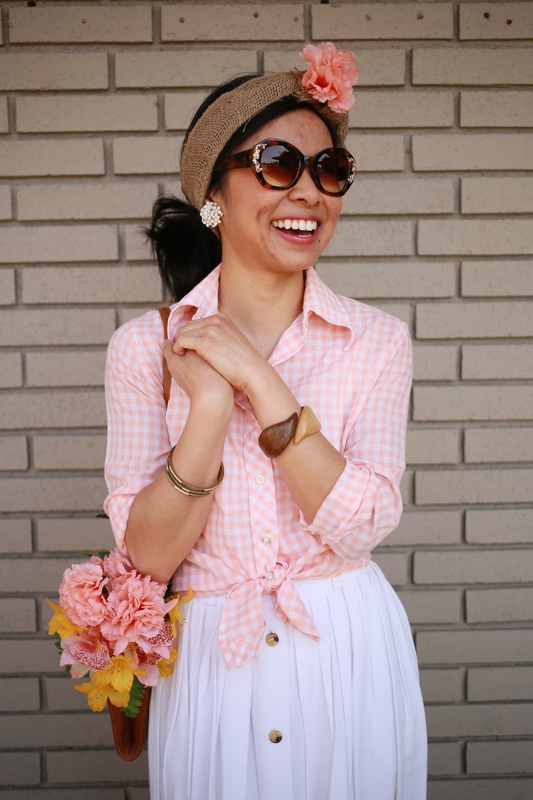 With the exception of the Lalakitty ballerina skirt, the entire outfit is thrifted. Like the skirt? Lalakitty is giving Chic Vic readers 20% off your next purchase with the code CHICVIC20. Get it now in time for Easter! Don’t put all your eggs in one basket. Unless of course, you’re putting items in your shopping cart for checkout at Lalakitty cause you’re getting 20% off. Answer: What is the windowpane print. I purchased this windowpane printed poly blouse last winter at my local Out of the Closet thrift shop. I was not particularly crazy about it, but I do have a penchant for semi-sheer blouses, and a weakness for twofer deals (the tie came attached!). 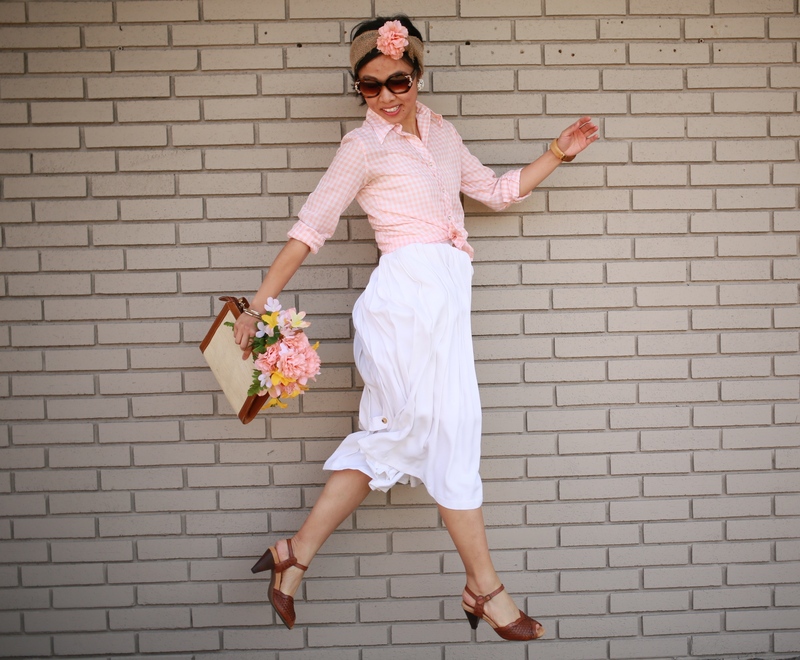 I channeled my inner Eliza Doolittle with a 1940’s twist. 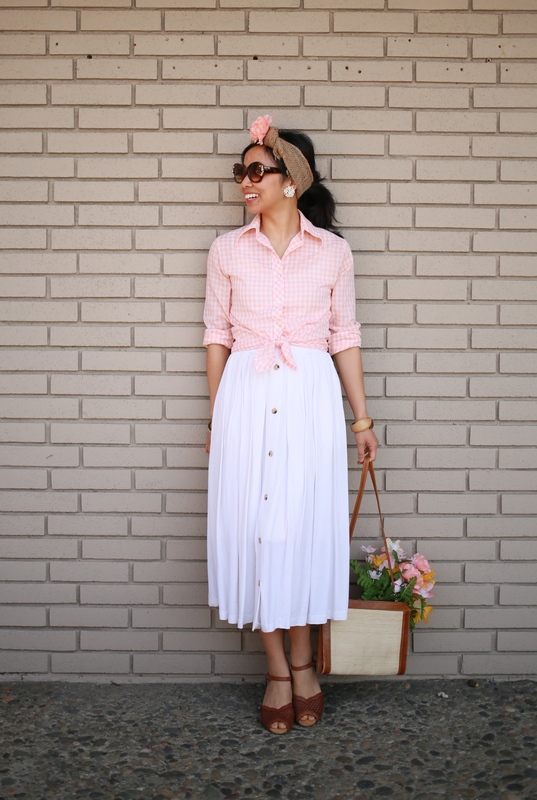 I decided to go modest with a wool midi-skirt, with the blouse tucked and belted in. I recently acquired this wide brimmed wool hat from Uniqlo (finally, a hat to add to my collection! 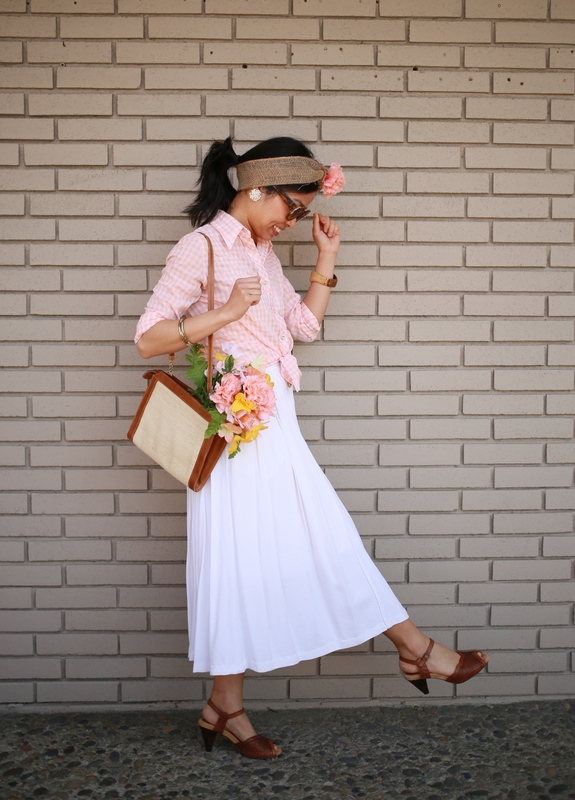 ), and it complements the outfit’s color palette and silhouette quite nicely. Added to the mix is a pair of old maroon pumps from my momma that match perfectly with my hat. Eliza’s look wouldn’t be complete without a bouquet of flowers! I feel like singing in the rain now. If I were a poor flower girl, I’d still know how to look dapper on a dime. Oh Professor Higgins, I’m a real fair lady now, aren’t I?